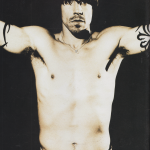 This issue came with a ‘gift’ cardboard cover over the actual cover with the picture of Anthony Kiedis on the back. Plus: New single and your dates unveiled. RED HOT CHILI PEPPERS recorded an exclusive performance of their new single ‘The Zephyr Song’ for ‘Top of The Pops’ during a secret eight-song mini gig in Los Angeles this week. The single, the second to be taken from the funk-rockers’ UK chart-topping album ‘By The Way’, is released on Octboer 21. The single will feature four new Chili Peppers songs- ‘Body Of Water’. ‘Someone’, ‘Out Of Range’ and ‘Rivers Of Avalon’- across the various formats. All four songs were recorded with Rick Rubin during the ‘By The Way’ album sessions in Los Angeles earlier this year. Currently on tour in South America, the LA superstars have lined up a UK tour for March. Their tour will call at: Glasgow SECC March 5, London Docklands Arena March 8 & 9 and Manchester Evening News Arena 11. 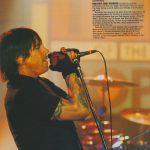 Look out for a world exclusive on-the-road feature with the Chilis in Kerrang! in the coming weeks. *’Top of the Pops’ was a UK TV music program that was aired on a Thursday evening.